Summer is almost here. And for lots of us, a break from school. The photo above shows my projects for the Knitting Olympics. At 12 is a pair of toe-up no-purl Monkeys for Karen. I had to re-knit from the ankle up because something strange happened to them in the too-tight department. They are in Tide Pooling BMFA STR ltwt. Going clockwise, those are toe-up no-purl Monkeys from my mom in Bella Coola, BMFA STR ltwt. They had the same mysterious ailment that Karen’s Monkeys had. Some kind of Monkey-dysfunction, undoubtedly caused when I got my new Signature DPNs and switched over in the middle of the sock. I had to tink both pair back to the lifelines for the legs and reknit. Next around the clock are my Queen of Beads in the colorway My Blue Heaven, BMFA STR ltwt from the RSC Club last year. I had one almost done, the second one went really fast. And no, the beads to not bother you when you wear them. 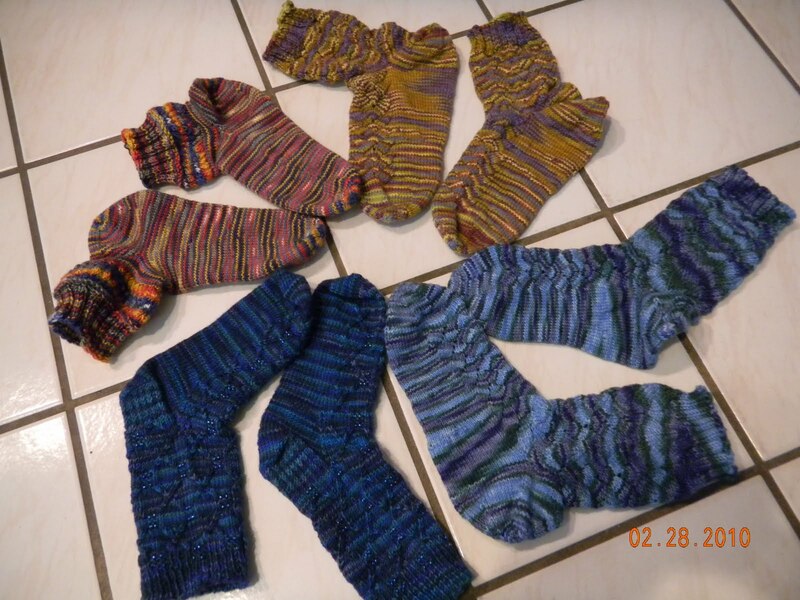 Last on the clock are some socks for my mom–one of Cat’s patterns from her Insouciant book. They are in a rare gem that I bought at Camp last year.